More Time Added to my 15 Minutes of Fame! Suddenly my blog viewer stats were spiking. What drew people here this time? I was stumped. And then I saw the e-mail from Dave Isay of StoryCorps. Their anthology, Callings: The Purpose and Passion of Work is now out in paperback form! This is exciting because one of the interviews in this book is mine, from 2009. I spoke at a StoryCorps booth in Jacksonville, Florida about how much I love being a bridgetender, and they felt that it was worthy of inclusion in this anthology! I was really honored. All the publicity, in O-magazine, NPR, Parade, Forbes, Time… all featuring me… this gave me a great deal of confidence. And it sent me down the path of publishing a book of my very own. 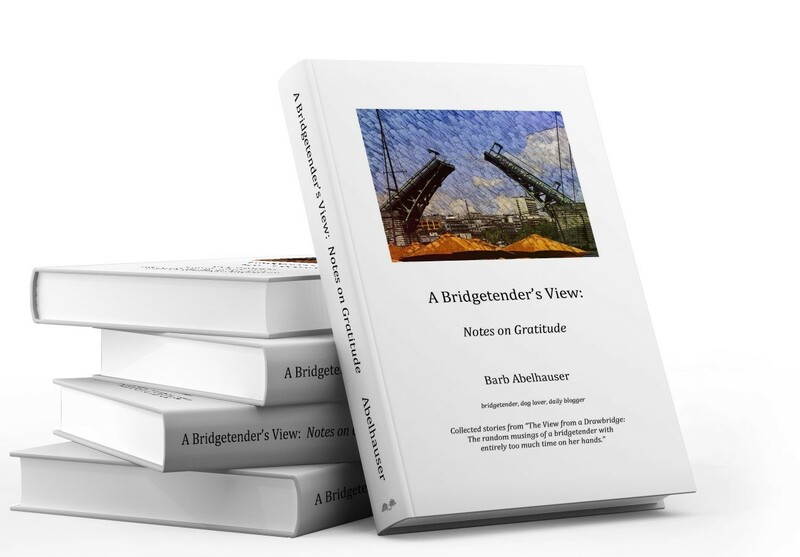 A Bridgetender’s View: Notes on Gratitude is available on Amazon.com. And because I appreciated StoryCorps’ vote of confidence so much, I am donating a dollar from every book sale to them. My book is available in deluxe color edition and on Kindle as well! So to say that I highly recommend Dave Isay’s book, in paperback or hard cover, is putting it mildly! And as he mentioned in his e-mail, it’s a great gift for young people who are just setting out on their career paths. The book is full of inspiring interviews with everyday people who managed to find their callings. Check it out! There’s a certain graceful beauty in a moving drawbridge. It’s awe-inspiring to watch a million pounds of concrete and steel in motion. It says a lot about human ingenuity. I’m lucky because as a bridgetender I get to make this happen every day. Opening a drawbridge never gets old. A friend of mine likes to say I do so with the power of my index finger. That makes me feel like Superwoman. I love to watch the wandering shadows that my opening bridge casts when it’s sunny out. I love to feel it sway when a truck crosses over or when the wind gusts. I enjoy watching people stop to take pictures as the bridge rises. I wonder how many thousands of pictures I’ve created for people throughout the years? How many people get paid to make waterfalls? How lucky am I? Brooklyn Bridge with waterfall. From an art installation in 2008. Okay, I admit it. I’ve been a bridgetender for 15 years, so I’m probably entirely too biased to write a blog entry of this type. But if I don’t, no one will. This job is full of unsung heroes. Simply Google “Drawbridge” and “Death” and you’ll see just how dangerous these structures can be. Think about it: A typical bridge is probably 2 million pounds of moving concrete and steel, and many people feel that they’re immortal, or at the very least that the rules don’t apply to them. That makes for a toxic brew. I’ve known many bridgetenders who have saved people’s lives. Many have thwarted suicide attempts, fished people out of the water by deploying life rings, or even pulled people out of burning cars after traffic accidents. And yet most people don’t even know we exist. Bridgetenders come to work every day and make the safety of the traveling public our top priority. Not a day goes by when our independent judgment doesn’t prevent a traffic accident or injuries to pedestrians who have chosen to ignore warning signals. And there are quite a few boaters out there who don’t adhere to Coastguard Federal Regulations. That puts everyone at risk. There really ought to be a monument to bridgetenders on the Washington mall, or at the very least, a statue at the foot of a drawbridge somewhere. If so, it should be in the likeness of Peter Fancher, who died on the job back in 1981. According to this article, he was working on the Seven Mile Bridge that links Miami, Florida to Key West when a passing truck struck a propane tank that was attached to the tower for some insane reason. The explosion engulfed the tenderhouse and a man who was just trying to make an honest living was cremated instantly. He was 39 years old. Most bridgetenders aren’t looking for thanks, as I mentioned in a recent blog entry entitled Loving My Thankless Job. But when the stuff hits the fan, after I do my best to set things to right, and after the adrenaline has worn off, I often think of Peter Fancher, and I’m very grateful to be going home in one piece. The Seven Mile Bridge today. The original bridge appears in the foreground and is used only by pedestrians. Sadly, Mr. Fancher’s swing bridge is long gone. Last night I got off work at 11pm. I went straight home, and managed to squeeze in 5 hours of sleep before getting up at 5:45am in order to go back to work at 7am. Oh, but there’s more. I get out to my car, and all the windows are frosted over. It’s 32 degrees out. So I scrape them. But the INSIDE of the windows are frosted as well. So I scrape those, too. Did I mention I have no heat or defrost in my car? So I drive down the road, freezing my patooties off, peering through a porthole-sized patch of window that is constantly fogging over, wiping it down every 30 seconds and hoping that no one steps out in front of my car. By the way, it’s still pitch black out. The sun doesn’t rise here until 7:20am at this time of year. As I toiled, a guy came by on his bike and shouted, “Great job!” It’s nice to be appreciated. By someone. Believe it or not, though, I do love my job. Just not this morning. I really have absolutely nothing to complain about. Nothing at all. Perspective. Recently I wrote a blog entry called How Soon We Forget, about a unique encounter I had with a fisherman on the job, and how I reacted when he passed away. That was a story that has weighed heavily on my mind for years, and it was good to get it out. There have been further developments since that posting. I had mentioned that StoryCorps wanted to include the story in their upcoming anthology, but their fact checkers couldn’t seem to corroborate it. Well, just the other day one of the fact checkers contacted me with a link to a brief article in the Jacksonville paper. Yay! Vindication! Well, sort of. The Florida Times-Union isn’t exactly known for getting their facts straight, but still, it’s unsettling see how different their version of events was. First of all, my old fisherman was only 51, a year older than I am now. Either the man didn’t age well or it was a different guy. But I never saw my old fisherman again, so that would be a strange coincidence. Also, he wasn’t found in the boat. They found the boat on the shore, the engine still running, and they found his body a mile further down, about 12 hours later. That must have been horrible for his family. In addition, he did have a job, so he wasn’t the content retiree I imagined him to be. I had this whole story about him in my head that was based on nothing. And that got me thinking about truth and my version thereof, and reality, and the way we perceive one another, and the way we fill in the blanks without even acknowledging that there are blanks. But most importantly, they claimed that he went out at 3 pm on this particular fishing trip, so maybe, just maybe, I wasn’t the last person to see him alive after all. So I think it’s time for me to lay this burden down. Maybe now we can both rest in peace. I decided it would be good for me to lay it to rest by telling the whole story at Fresh Ground Stories, a fantastic storytelling group that I sporadically attend here in Seattle. You can hear a recording of it here. At the end of the story it automatically starts playing two other stories I’ve told, so just stop it if you don’t want to hear them all. But let me know what you think! 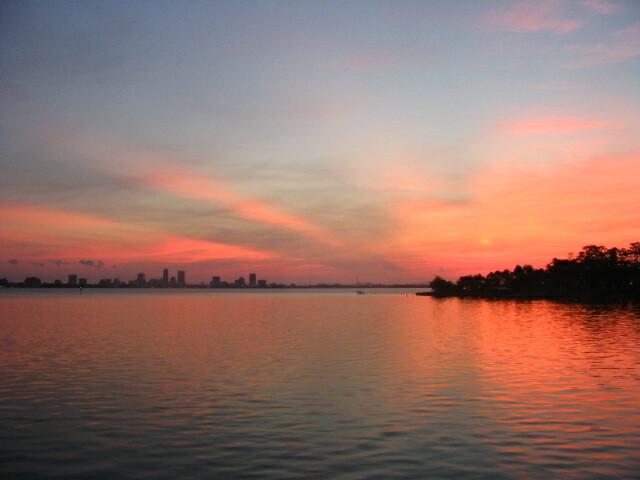 The Ortega River as it heads out to the St. Johns River at dawn. Most likely the last thing my fisherman friend ever saw. The other day at work I had Fall Prevention training. As a bridgetender, there will occasionally be moments where I’m called upon to work at a dangerous height, so this training is essential. The fact that I never received this type of instruction in my thirteen years as a bridgetender in Florida tells you everything you need to know about the difference in work culture here in Seattle. My current employer actually cares if I live or die. Yeah, yeah, part of that is due to litigation, I know, but I genuinely believe they value me much more than my former employer ever did. Heaven knows they pay me more. The class was actually rather interesting. Not only did I learn how to properly inspect, wear and maintain my harness, but I learned some basic physics. 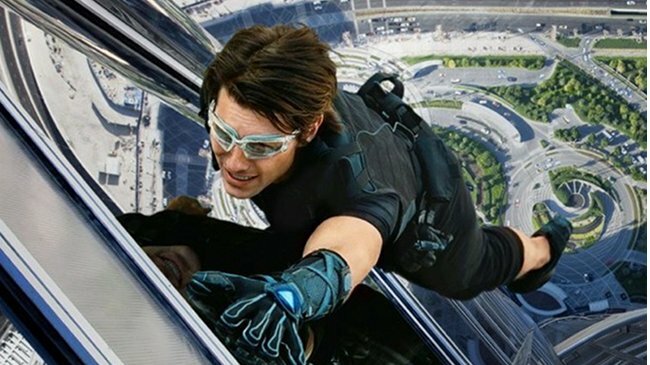 To oversimplify things to an extreme degree, there’s no point in attaching your harness to a 60 foot rope if you’re standing on the edge of a 40 foot drop. I also learned something rather fascinating. If you do fall and you’re dangling in a harness for more than a minute or two, expect to pass out cold when you are finally rescued. That harness is going to cut off the circulation to your legs, so your body will be taking all the oxygen out of the blood in the lower half of your body to survive. So when you finally stand up again, all that deoxygenated blood is going to rush to your head, and, basically, it’ll be lights out. You can count on it. They don’t show you that in the movies. But of course, since I live in my head most of the time, I also learned a few philosophical truths along with everything else. Learning how to fall is important. If you do it right, you’ll survive. It’s okay, it’s even attractive, to be vulnerable, but it’s also critical to have contingency plans and put serious thought into everything that you do. Prevention is key, but plans are necessary, too. It’s also about educated faith. Trust the equipment, but inspect it first. If you’re going to fall, make it a knowledgeable fall. If I had a coat of arms, I think that should be my motto.